Last Friday I made the trip to my monthly chiropractor appointment. Usually when Dr. Jen asks me how I'm doing, my response is "great!" But this time, I said "not good, I hurt. I went on to explain where I hurt." She just looked me and shook her head. She went about doing her business with my adjustment and then got to my legs. She said "are you rolling?" I admitted I hadn't. Ooops. I knew it. I know better. I just got lazy. She did her magic, told me to roll and take it easy, and to come back in a week. I went home and immediately began rolling. I rolled for about 45 minutes. It hurt so much, but I felt fabulous afterwards. The entire time I kept singing to myself "rolling with my foamie" - mostly because I'm a dork, but because it made me smile thinking about Terry, my yoga instructor, during my first classes with her while training for my 1st marathon. Since Friday, I've rolled every single day and I am no longer in pain. No weird aches, no pains. I feel great! But I'm NOT going to go crazy and jump back in like I want to! I'm going to ease back in and be smart about it. Or about as smart as I can be, knowing that GCI is 45 days away! On Sunday, I set out for an 10 mile run. Around mile 7, my knee felt achy and I didn't want to push it so I finished up at mile 8, came home and rolled. It was a slow run too. I wanted to go fast. I wanted to crank through the miles, but I knew I shouldn't. I just took it easy and enjoyed being able to run. It's all about recovery right now and training for that ultra! I even stopped to admire my favorite places along the rail trail. 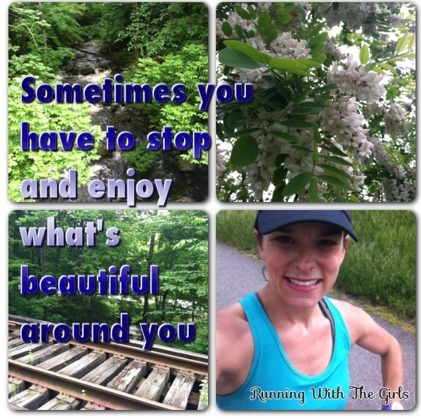 Spring is one my most favorite times to run, mostly because it's like rediscovering life all over again. New blooms, flower smells, running streams. Tell me, when is your favorite time of year to run? What kind of flower are those in the picture above? There is a wall of them along the rail trail and they smelled absolutely fantastic. I wanted to hang out there all day long. When you return from an injury, do you play is smart and take it easy? or do you just dive right in? I've been rolling a lot more again, but definitely need to do my back. I tend to just focus on calves, feet, glutes and ITB. I just received a cool little ball for rolling my feet. I am love with it!!! I've been lazy about rolling lately too--I'm trying to commit to doing it every day, especially since I just started marathon training. It makes such a difference! Rolling really does make a difference!!! I love to run when the air smells like ocean. It doesn't always have that smell, but that is my favorite time. Not the clam-flat-ocean smell but the clean ocean smell. :) Other than my PF, I've never been injured. Lucky me. You know me Jen, I am a little stubborn and stupid and not necessarily in that order. However, this one has got my attention and I am trying really hard to do what the doctor tells, me. Doing better than usual, but still not as good as I should. 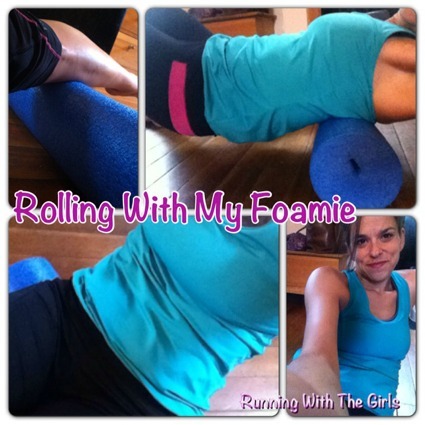 Thanks for the reminder to get "rolling with my foamie". LOL I've been slacking on that and feeling a lot of twinges that could get worse if I don't watch out. I don't stop often enough to document the beauty around me. Thanks for sharing your scenery. I'm probably overly cautious when I start up for a run post injury, I need to roll out a few bits and bobs actually - thank you for the mind-bump. Spring is my favorite time too, although after the rain in late eummer, early fall is a close second. It is killing me to be not running right now, but I m getting closer :) Glad you got in 8 good miles even if they weren't as fast as you wanted! This reminds me that I really need to foam roll;) Great job easing back into things. I know it's hard. haha, rolling with my foamie. That made me laugh! I'm glad the roller is doing the trick for you. My roller and I are tight, although I should do my back/shoulders too.